2931 Coral Shores Drive is a boutique style home in Coral Shores in Fort Lauderdale. This three bedroom, two bathroom home has been completely remodeled with tankless water heaters, impact windows, and new appliances. Both bathrooms have contemporary vanities and frameless showers. Granite counter tops and stainless appliances in the kitchen give it an updated look. Additionally, this home is located just one mile from the beach and has a 70 foot dock. To see this home or others within the area, speak with a Better Homes and Gardens Real Estate agent today! 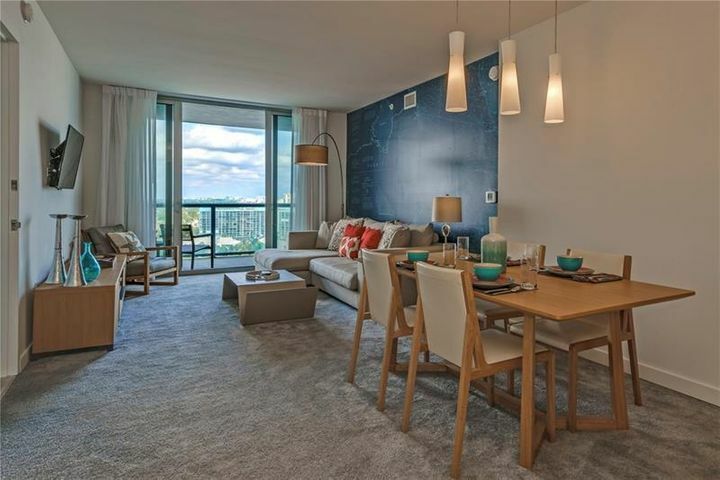 2602 E Hallandale Beach Blvd is a two bedroom, two bathroom condo with panoramic intracoastal views. This home has up-to-date bathrooms with contemporary vanities. The kitchen is large enough to accommodate guests and is designed with modern and clean elements. A large, oversized balcony overlooks the intracoastal and is excellent for entertaining. This building includes ammenities such as the owner's lounge with a spectacular infinity pool and terrace, beach club, ground floor pool, fitness center, restaurant, concierge, free shuttle service, and valet. Speak with a Better Homes and Gardens Real Estate agent to see this or similar homes today! 2580 SE 7th Street is a three bedroom, two bathroom home located in Pompano Beach. A recent price change brought this beautiful home from $599k to $579k, making this home even more desirable. Fully tiled floors lead throughout each room of this updated home. The granite counter tops and upgraded cabinetry really lend itself to the beauty of the kitchen. The master suite features his/hers closets and a large bathroom suite with a soaking tub. Entertain under the screened in patio or in the backyard which has an oversized pool. Don't miss out before its gone. Contact a Better Homes and Gardens Real Estate agent today! 5100 N Ocean Blvd is a beautiful two bedroom, two bathroom condo with unobstructed ocean views in the Sea Ranch Club in Lauderdale by the Sea. This home has a galley style kitchen with granite counter tops, a breakfast bar, and stainless steel appliances. The bedrooms feature views of the ocean and/or intracoastal, as well as plantation shutters that add a touch of modern elegance. In addition to all this home has to offer, there is a semi-private elevator, club house, cabana bar, pool, and beach access. Don't miss out on this ocean front condo. Speak with a Better Homes and Gardens Real Estate agent today! 529 NE 25th Street is a revised, Wilton Manors home fitted with three bedroom and two bathrooms. Impact windows, driftwood porcelain plank wood flooring, and high hat lighting are just some of the upgrades. The open floor plan allows the main living area and kitchen to flow seamlessly. Each bathroom has been updated with new contemporary vanities and frameless glass showers. An over sized, heated, salt water pool with a bahama shelf awaits in the fenced backyard. To see this or other homes in the Fort Lauderdale area, contact a Better Homes and Gardens Real Estate agent today! 538 NE 17th Way is a move-in ready home located in Victoria Park In Fort Lauderdale. This five bedroom, three and a half bathroom home is fitted with everything you need, from the marble floors to the plantation shutters. Elegant and contemporary details in the kitchen, such as the Jenn Aire appliances, custom cabinets, and a large breakfast bar to seat a large family. The open floor plan offers plenty of space but the ability to still spend time together while doing multiple activities. Additionally, this home is fitted with a pool in the fenced backyard. You don't want to miss out on seeing this home, so speak with a Better Homes and Gardens Real Estate agent today!